Bull Put Spread - What Does It Mean? What is the definition of a "bull put spread"? What is the definition of a "bull put spread"? 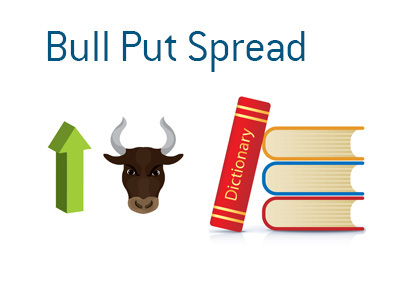 A "bull put spread" is a credit spread that is entered into in order to take advantage of a stock that is expected to advance in price. In the "bull put spread", a trader will sell a put at a higher strike price and buy a put at a lower strike price. By buying the put, the trader locks in his maximum loss. Microsoft is currently trading at $50 per share. You expect that the shares will increase moderately in price over the next month. In order to take advantage of this theory, you decide to put on a bull put spread. By doing this, you will sell one in the money put and buy one out of the money put. Note: the put that you sell doesn't have to be in the money - you can choose to sell one out of the money put and buy one every further out of the money put. So, immediately you book a credit of $1.50 for the trade ($3.00 - $1.50). Now, if MSFT closes over $50 by the time that the options expire, you will get to keep the entire $1.50 premium, as both options will expire worthless. The maximum loss on the position will be the difference between the two strike prices ($50 - $45 = $5 in this case), minus the premium that you received ($1.50). So, even if MSFT went to $1/share overnight, your maximum loss would be $3.50 * 100 = $350. Now, if MSFT closes at $49 on the day that the options expire, you will make a profit of $1.50 - $1.00 = $0.50, as the July $50 put that you sold will be worth $1, and your $45 put will expire worthless. Given that you received $1.50 in premium to start the trade, you will need to pay $1.00 to close out your put, leaving you with $0.50. This is the "bull put spread".